1. ZAP! is made up of 2 ingredients: 95% organic sugar cane alcohol and 100% raw Ontario propolis. 2. What is propolis? Honey bees collect plant resin on their hind legs and deposit it in their nest, where they often combine it with beeswax. This age-old alchemy creates propolis . Propolis is Greek for “pro” – in front of or defense of “polis”, which means “city”. Propolis essentially means “before the city”. 3. Why do honey bees collect plant resin? Honey bees have 1/3 of the genes involved in immunity function compared to the fruit fly and the mosquito , which they make up for in other ways: social grooming, and collecting propolis to name a few. Studies show that honey bee hives that have a “propolis envelope” are less susceptible to bacterial, viral, and fungal infections [2, 4]. 4. What kinds of plants does the resin come from? The chemical composition of propolis is complex and can vary between plant types, which means there is less likelihood of pathogens developing resistance to it . The main sources of plant resin that honey bees collect from are Populus (cottonwood, poplar, aspen), Betula (birch), Salix (willow), and Alnus (alder), and Aesculus (horse chestnut) [2,4]. 5. I designed the formula for ZAP! while pursuing my Masters in Environmental Science at University of Guelph’s Honey Bee Research Centre. After pouring over dozens and dozens of research papers about propolis, I came to learn that its antiviral properties have been studied on the herpes simplex virus and the influenza virus. I passed a vial of my propolis tincture to my older sister, who was suffering from large, painful, and very persistent cold sores. My sister has been using this tincture since 2010 and says it’s the fastest acting treatment she has ever used. 6. Speaking of fast acting, ZAP! is also 100% all-natural. There are only 2 ingredients and NO synthetics! 7. ZAP! comes as a liquid in an amber vial. It has a pleasant vanilla-like odour and goes on clear. 8. DO NOT take the dropper out of the vial. It’s important that you don’t introduce your cold sore virus to the tincture. You don’t want viral resistance forming, do you? 9. ZAP! is only $10 for 4mL – that’s a whole lotta bang for your buck! 10. 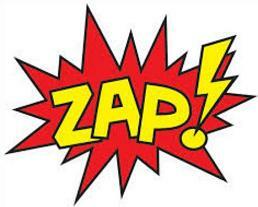 As the name implies, ZAP! will zap your cold sores into oblivion! Apply a small drop of ZAP! to your cold sore and you’ll feel it go to work immediately, and expect it to sting a bit. It’s a treatment, not a cure. 1. Evans JD, Aronstein K, Chen YP, Hetru C, Imler JL, et al. (2006) Immune pathways and defence mechanisms in honey bees Apis mellifera. Insect Mol.Biol.15(5): 645–656. 3. Gekker G, Hua S, Spivak M, Lokensgard JR, Peterson PK (2005) Anti-HIV-1 activity of propolis in CD4+ lymphocyte and microglial cell cultures. Journal of Ethnopharmacology 102, 158–163. It’s good to be back, even if it is just for a quick check-in. Things are always in motion, and I’m sure we all wouldn’t have it any other way. Up-coming articles will include my guerrilla-style wax purification method, and the scientific breakdown of HOW the queen keeps millions of sperm alive in her spermatheca for at least 4 years. 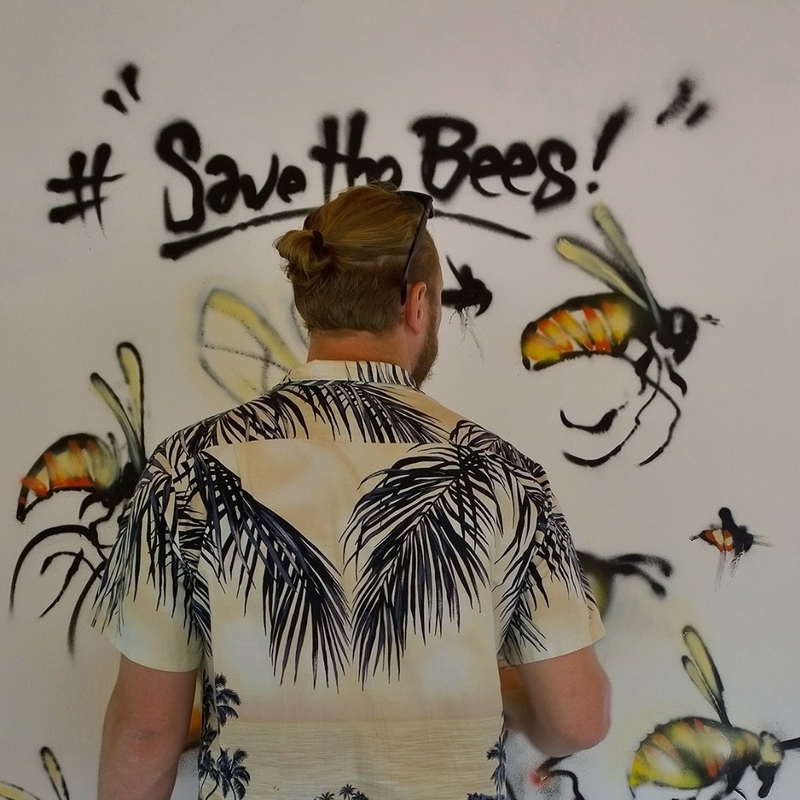 Campaigning street artists Louis Masai and Jim Vision have joined forces over the past week to raise awareness amongst London’s Eastenders about the dangers posed to Britains Bee population. The issue has been well trailled over the past few years with more and more acknowledgment given to the fact that if something isn’t done soon then a key part of our eco-system could end up seizing up as the pollinators suddenly disappear. I have been away from the computer for a little while, that’s for sure! Things really do pick up quickly once the bee season starts. I’m currently looking after my own hives and getting geared up for when my Dad’s buckwheat crop comes into full-swing. Buckwheat honey tends to be a little strong-flavoured in my opinion, but tastes amazing when mixed with another kind such as sunflower or wildflower. 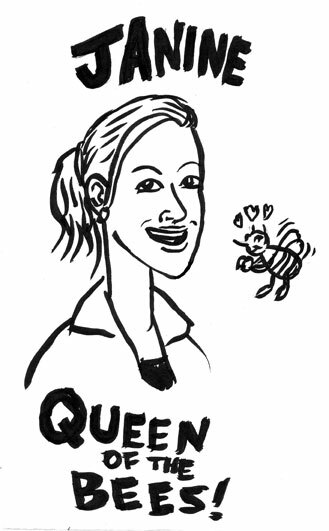 I’m also working on a longer article about the science behind how the queen honey bee keeps millions of sperm alive in her spermatheca for more than 4 years; a topic that has interested me so much that I want to get right to the bottom of it before I rise it to the top! 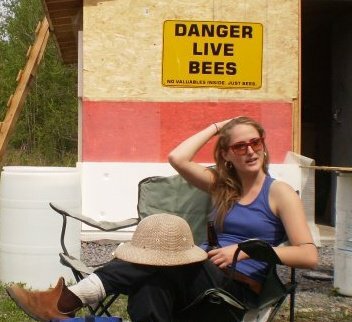 In the meantime, enjoy this photo of me “hard at work” at one of my friend’s bee-yards in Ottawa. When asked to describe what beekeeping is like I would usually liken it to specialized detective work. I would approach the colony and look for external signs of distress or disease, and the amount and appearance of any dead bees. I would also watch for the level of colony activity, and whether or not I could see any workers returning with pollen in their corbicula. I would then remove the lid and crack the inner cover, and immediately smell for any sign of disease within the hive (American and European Foulbrood has a very distinct odour). I could go on and on about all the troubleshooting and deductions a good beekeeper can do when they’re diagnosing a situation inside an ailing beehive. It feels like very rewarding detective work, so it’s no wonder that Sir Arthur Conan Doyle had his Sherlock Holmes retire to become a beekeeper; a fact that stays consistent in several versions of Holmes’ later years. If you were to take a look at my bee resume you’d get a small glimpse of all the different types of research-themed pies I had my fingers in over the years. Back in 2007, Dr. Karol Mathews made multiple visits to the University of Guelph Honey Bee Research Centre to purchase our raw honey. I almost instantly developed a nerd-girl crush on Dr. Mathews, and wanted to find out exactly what she was doing with all this raw honey she was buying on behalf of the Ontario Veterinary College (OVC). As soon as I found out, my almost-crush was then upgraded to absolute. Dr. Mathews (who told me to call her Karol) was using the raw honey as a topical antibiotic/medication for drag and burn victims that would come into the OVC. A camera crew came to the Bee Lab to shoot a video about all this one day in early April 2008. Even though you can’t see me directly, I made a point of being in view, or at least in the background. The following video has some graphic scenes, and the beginning to around the 6:50 minute mark shows several shots of burn victims and open wounds…and might not be for the squeamish. The Bee Lab action starts at 6:52, with me in the shot over Paul’s right shoulder at 8:48. I believe Dr. Mathews is on to something so simple and accessible to pet-owners and veterinarians alike (the human applications are endless too!). There are almost too many facets to what medicinal honey is about, but the first few are: 1. Antibiotic resistance is almost futile when using raw honey. 2. Medicinal honey is non-toxic and will not contaminate/harm your animal or household. 3. Medicinal honey is yet another superb way beekeepers can be supported by the masses. If you want to learn more, type in “Karol Mathews medicinal honey” into Google or Google Scholar.